Even though my husband, Shane, was an air force brat, he identifies Texas as his home. He was born there and, before moving to Upstate NY, spent the longest part of his life there. His parents live in San Antonio as does his brother and sister-in-law. I am from New York: born in Manhattan, raised on Long Island, educated in Manhattan, now living in Upstate NY. Drain ingredients to keep the final product from getting all watery; the black beans will break down and liquefy after being cooked for a while. Put tomatoes into big pot along with beans and tomato paste and beer, over medium-high heat, bring to boil, stirring all along. Brown meat and 4 oz garlic in large skillet with 4 tbsp oil and spices (high heat), about 12 minutes. Drain meat juice into a saucepan and put the mushrooms in there on high heat, cook for about 10 minutes until nice and soft. Dump meat into the pot and stir. Cook onions and zucchini and 4 oz garlic in large skillet with 4 tbsp oil until translucent and caramelized, with spices (high heat), about 6 minutes. Dump veggies into pot and stir. Dump jalapenos into pot and stir. Add remaining spices, and hot sauce to taste. Cook till it gets all gooey (about 40 minutes) and then it’s ready to serve! Sigh. Thank you. Viva la revolucion. 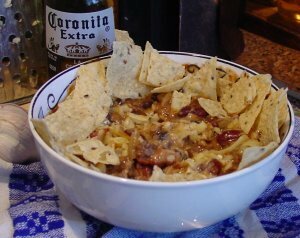 (ReasonInRevolt is my husband, the author of the chili recipe. )Incidentally, for the non-veggie chili, I’d leave out the mushrooms & zucchini completely. It tastes great but I find it a bit jarring to find in chili.